We are very excited and proud to announce our 50 Year Aniversery this year. 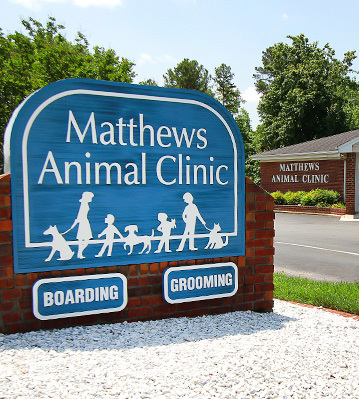 Matthews Animal Clinic is one of the earliest businesses originating in the community. We began as a mixed animal (farm, equine, and family pets) clinic started by Dr. Allen Cleveland who was a sole practitioner. Over these five decades we have grown to 10 veterinarians and a staff of over 50 employees and are still a stalwart hospital in Matthews. We plan to celebrate our half-century birthday by recognizing our awesome clients and their pets this fall. Mark your calendar for Saturday, October 13th from 2:00-5:00 pm. We plan to have some food, fun games, giveaways and hospital tours. More details to follow. Matthews Animal Clinic opened in 1968, when Matthews was a small town with one grocery, one barber and two hardware stores. Back then, we were a full-service clinic, providing healthcare services for companion animals, farm animals and horses alike. It wasn't unusual to see a horse trailer in the parking lot, or come in to find that the doctor was out delivering a calf. That all changed as Matthews started to grow. 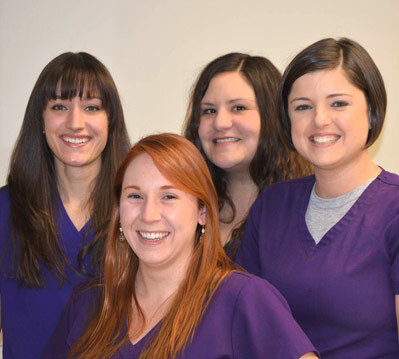 In 1977, we became a two-veterinarian practice and by 1996, we were a five-veterinarian practice. In the meantime, we ended the large animal aspect of our practice to focus more fully on providing the highest-quality, most personal care to the dogs, cats and pocket pets in our community. Now we're the oldest and largest veterinary hospital in the Matthews area. We attribute this growth to our passion for what we do and the commitment we make to each pet and pet owner who walks in our door. 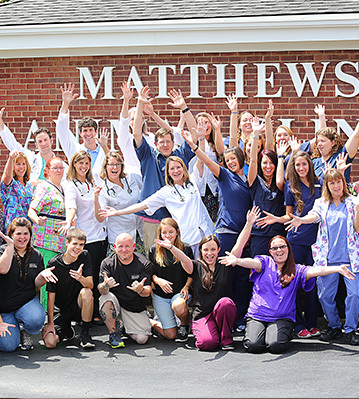 We invite you to come see what makes Matthews Animal Clinic such a fixture in our community. Our website features a detailed look at the services we provide, helping you understand why you should trust us with your pet's care. If you have any questions or would like to schedule an appointment, please email or call (704) 847-9856. We look forward to meeting you and your cherished companion. Matthews Animal Clinic is accredited by the American Animal Hospital Association (AAHA) - a designation achieved by a very small percentage of animal hospitals in the country. AAHA is the world's leading association of companion animal practitioners. To maintain AAHA certification, our hospital must pass comprehensive inspections of our facility, medical equipment, records and management. We're also dedicated to the welfare of the helpless animals in our community in addition to many local organizations. We donate over $40,000 worth of free and discounted services to groups such as the Union County Humane Society, Boston Terrier Rescue, Mecklenburg County Humane Society, the Fraternal Order of Police, the Siskey YMCA, M.A.R.A., Matthew's Rotary Club, Make A Wish Foundation, Special Olympics, Libros For Learning, Matthew's Farmers' Market, and several local high schools and churches. We also work hard to assist the concerned animal lovers of the community in fostering, treating and finding homes for the many stray, abandoned and mistreated animals in the area. If you would like to help any of these groups in their fine work, please contact us to find out how to donate time, money and supplies. Payment in full is due upon completion of services. We accept cash, checks, Visa, MasterCard, American Express, debit cards and CareCredit.